The messenger bag is made of heavy duty and water resistant canvas which provides more protection for your laptop and books.With the well-thought structure and adjustable shoulder strap and top handle ,it can be carried by the handle as briefcase , worn on shoulders, and across body.It is perfect for men and women who need take laptop and many things to college, high school or work. 1 large zipper pocket with 8 card slots and 2 pen slots,1 key chain inside . 2 open pockets and 1 zipper pocket for values. 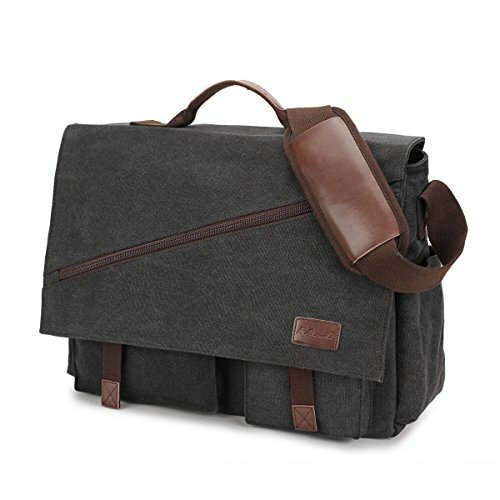 Durable: This mens messenger bag is constructed with soft and durable cotton canvas,which it is heavy duty and water resistant.It can protect your computer and books entirely. Multiple Pockets: Large capacity with more than 14 pockets that fits all of your stuffs you need. 1 zipper pocket on the flap,External access to 2 front pockets under flap, 1 large zipper pocket with 8 card slots and 2 pen sleeves,1 key chain and 2 side pockets for umbrella, 1 back zipper pocket with leather clasp. Internal access to 1 main zipper compartment, 1 padded laptop compartment fits 15.6 inch laptop with velcro closure,2 slip pockets and 1 zipper pocket keep things organized. Easy To Carry:The extra padded laptop compartment fits 15.6 inch laptop,wide and thick shoulder strap comes with a movable thick shoulder pad which provide extra comfort for your shoulder.With adjustable shoulder strap ,you can wear it cross-body or on shoulder and with the top handle it could also be a professional briefcase. Large Capacity: The size of this spacious satchel is 16.9 x 5.5 x 13.6 inch, which it is roomy for laptop ,books,camera,clothes. Laptop compartment size at 15.4 x 2 x 11.8 fits 15.6 inch laptop,and Weight:2.65LB/1.2kg,Adjustable strap :13-25.2in/33-64cm,Top Grab Handle Drop:2.6in/6.5cm. The satchel bag can be carried by the handle as briefcase , worn on shoulders, and across body.It is a good messenger bag for men and women and perfect satchel for business, work and college. If you have any questions about this product by RAVUO, contact us by completing and submitting the form below. If you are looking for a specif part number, please include it with your message.